The Altus M310 front derailleur delivers top notch Shimano shifting performance for your 3x7 or 3x8 speed Shimano drivetrain. 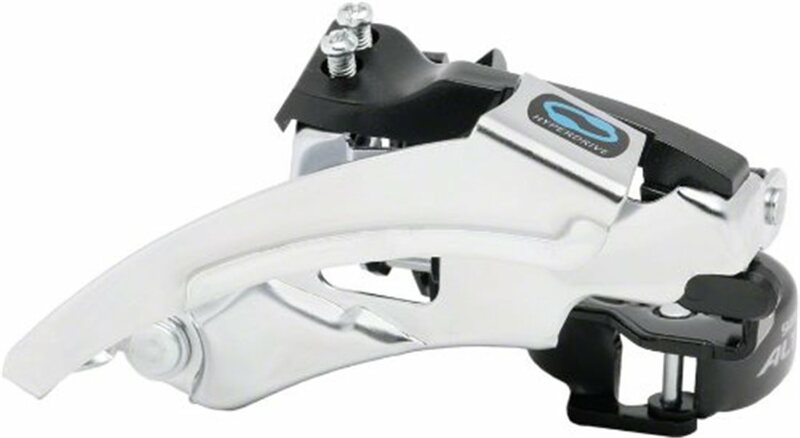 A perfect solution for riders seeking a dependable front derailleur for their commuter, or casual get around town bike, but don't want to break the bank. Needed this for same reason as shifters...to get my daughters old bike back on the road. The older model on the bike was actually not in need of repair, but was (for me) impossible to easily remove to clean, etc. Poor design in my opinion. Now this one was much, much easier to install and adjust. Good upgrade and great price! Up grade over worn stock part. Works like a charm. I have used Jenson for years and always will. Thank you !! Front derailleur fit perfectly. There were no problems with the set up or fitment to frame. Shifting is now so much smoither and direct than worn out mech. Very happy with Jenson and my new front derailleur ! BEST ANSWER: It includes shims to fit various seat tube sizes.